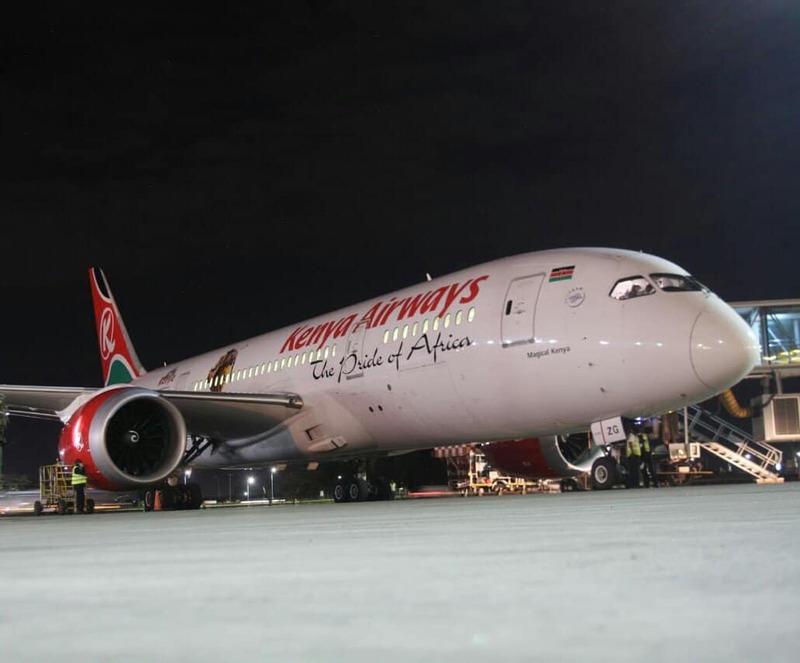 Kenya Airways’ most senior pilot Captain Joseph Kinuthia sets history tonight as he charters the Boeing 787-8 Dreamliner (5Y-KZE) flight KQ002 from Nairobi to New York. The 65 year old has flown over 25,000 hours and worked for over 40 years at Kenya Airways. He has flown powerful personalities including former President Daniel Arap Moi and Pope John Paul II. This will be his first Kenya Airways direct flight from Nairobi to New York. The flight is scheduled to depart from the Jomo Kenyatta International Airport at 10.55pm, Sunday. The Boeing 787-8 Dreamliner will touchdown at the John F Kennedy International Airport at 1.55 pm EAT (06.55 am GMT-4), Monday. With a capacity of 234 passengers- 30 in business class, the aeroplane has on board President Uhuru Kenyatta, CNN’s Richard Quest, Foreign Affairs Cabinet Secretary Monica Juma, Kenya Airways chief executive Sebastian Mikosz and chairman Michael Joseph among others. The 15-hour flight will cut short the long hours spent by passengers in different continents to catch a connecting flight to the USA. The flight coming back on Monday, flight KQ003, will depart JFK at 12:25 pm on Monday and get to Nairobi at 10:55 am on Tuesday, taking only 14 hours. Kenya Airways will be the first airline in East Africa to have a direct flight to the USA. Other countries with direct flights from Africa include: South Africa, Nigeria, Ghana, Cape Verde, Ethiopia, Senegal and Morocco. On Friday, Justice Byram Ongaya suspended the Kenya Airways workers- strike, on the inaugural day, pending hearing of their case. After the inauguration, Kenya Airways will be deploying a Boeing 787 Dreamliner jet for their daily flight to New York city.